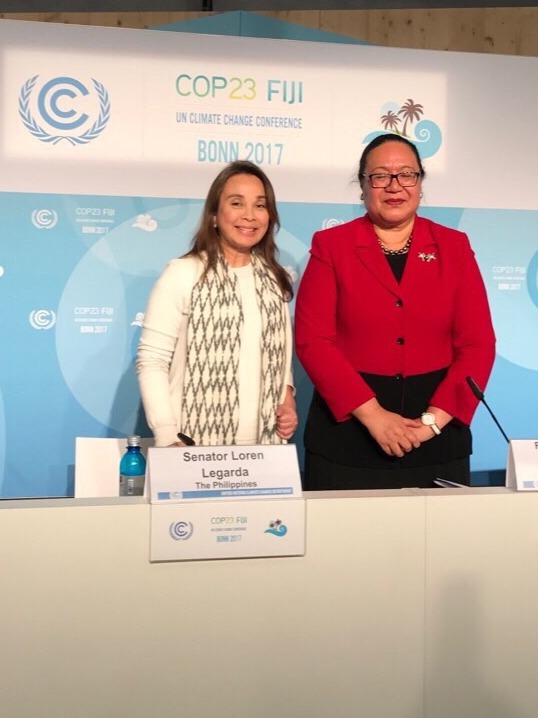 Senator Loren Legarda is leading efforts to once again bring to the fore the Philippines’ climate change advocacy at the ongoing 23rd Session of the Conference of Parties (COP23) to the United Nations Framework Convention on Climate Change (UNFCCC) in Bonn, Germany. 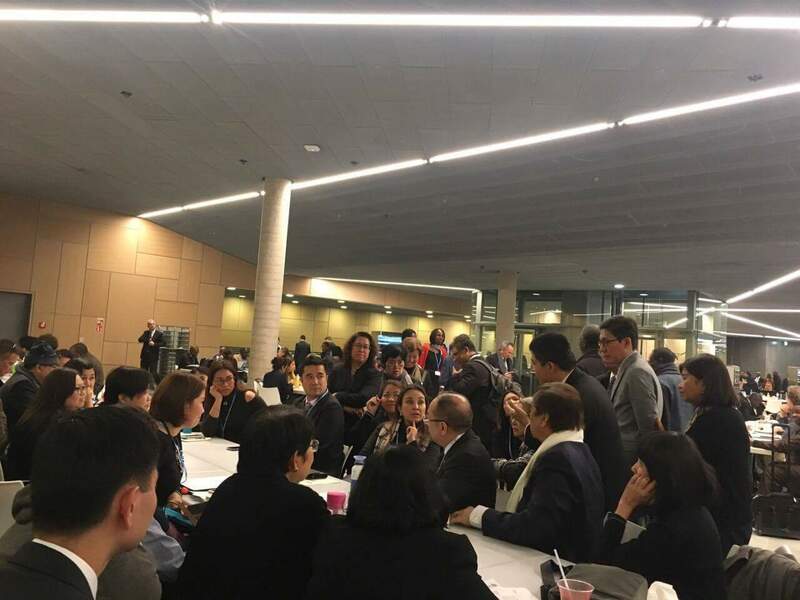 She heads the Philippine Delegation to COP23, composed of officials from Philippine Government agencies handling climate change-related issues, together with Secretary Emmanuel M. De Guzman of the Climate Change Commission. The representatives of various countries, including the Philippines, are currently drawing up a comprehensive rule book that would facilitate the implementation of the 2015 Paris Agreement on Climate Change from 2020 and beyond. Senator Legarda leads the discussion with the Philippine delegation on cross-cutting issues related to climate change. “The Philippines’ active involvement in this year’s climate talks signifies our steadfast commitment to realize the principles that we have championed in the Paris Agreement, which we ratified early this year. This is yet again a manifestation of our commitment to climate justice—to make the developed and industrialized countries answer for contributing the most to global warming and climate change—as well as a testament of our solidarity to the call for greater and more ambitious global climate action,” Senator Legarda said. Philippine Ambassador to Germany Melita Sta. Maria-Thomeczek, for her part, welcomed the country’s strong participation in COP23. “We are glad to welcome all our delegates, led by Senator Legarda and Secretary De Guzman, to Bonn. In the past few days, they have been engaged in a series of fora and workshops which are, of course, crucial in the effective implementation of the Paris Agreement,” the Ambassador said. 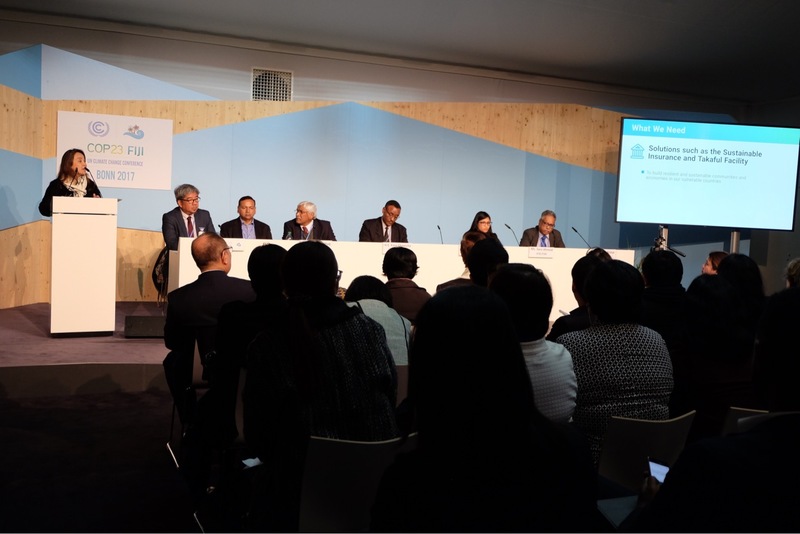 Together with other leaders and climate change experts, the Senator also had the opportunity to spell out the Philippines’ commitments and strategy on climate change on the sidelines of COP23. During the side event, “Championing NAPs – Advancing National Adaptation Plans,” Senator Legarda shared that the Philippines has made significant progress in the development of a National Adaptation Plan (NAP) with the enactment of the “Climate Change Act of 2009” (Republic Act 9729), which mandates the updating of the National Climate Change Action Plan. National Adaptation Plan Champions, Senator Legarda and Ms. Fekitamoeloa Katoa ‘Utoikamanu of Tonga. RA 9729 was principally sponsored and authored by Senator Legarda who chairs the Senate Committees on Climate Change, Foreign Relations, and Finance. The Senator called for scaled-up, continuous, predictable, and adequate financial support for adaptation. For her efforts, the Senator was named NAP Champion by the UNFCCC Secretariat last November 13, alongside Fekitamoeloa Katoa ‘Utoikamanu (Under-Secretary-General and High Representative for the Least Developed Countries, Landlocked Developing Countries and Small Island Developing States) – a development welcomed by the Philippine Embassy. “We are very proud that Senator Legarda was named NAP Champion, which recognizes her tireless efforts to push for decisive action on the issue of climate change, both domestically and in the multilateral arena,” Ambassador Thomeczek said. Mr. Youssef Nassef, UNFCCC Adaptation Committee Director, noted that the designation of Senator Legarda and ‘Utoikamanu as NAP Champions is “the first in the process of UNFCCC,” signifying the urgent need to promote the importance of resilience and facilitate linkages with external contexts to climate change adaptation. In her keynote address at the forum, “Innovative Climate Finance Strategies and Instruments by and for Climate Vulnerable Countries,” Senator Legarda assured the Philippines’ international climate allies that the country’s Nationally Determined Contributions (NDC) would be compatible with the 1.5 ˚C-limit in the rise of global temperatures prescribed by the Paris Agreement. “We continue to pursue a development path consistent with 1.5 degrees not only because we know it is the best way to protect our people and climate, but also because we know it will also spur economic growth. More than just transitioning our energy sector to clean energy-powered economies, the race to 1.5˚C-compatible economies presents to the ambitious an opportunity to transform development itself,” the Senator said. “We need to foster a policy environment that will raise the participation of the financial sector in low-carbon investments needs. One strategy could be to identify the best mix of lending instruments to attract low-carbon investments,” Senator Legarda said. She likewise mentioned that she filed a proposed measure to establish environmental units in every banking institution. This will assess and ensure that projects, subject to financing applications as well as collateral offered as security, comply with Philippine environmental laws. She also stressed that climate action makes good development sense.